Added by larry campbell almost 4 years ago. Updated over 3 years ago. I have a use case where we have a 21-bit block of IP addresses (4,096) that we cannot further subnet. The router is maintained by another organization, and we already have hundreds of devices using this network, mostly statically assigned. We currently block off ranges in a spreadsheet for each customer, and they maintain their own IP Addresses. We now want to implement a Foreman server to manage the IP addressing, and would like to limit the range of available IPs for each customer. - ??? other relevant info? 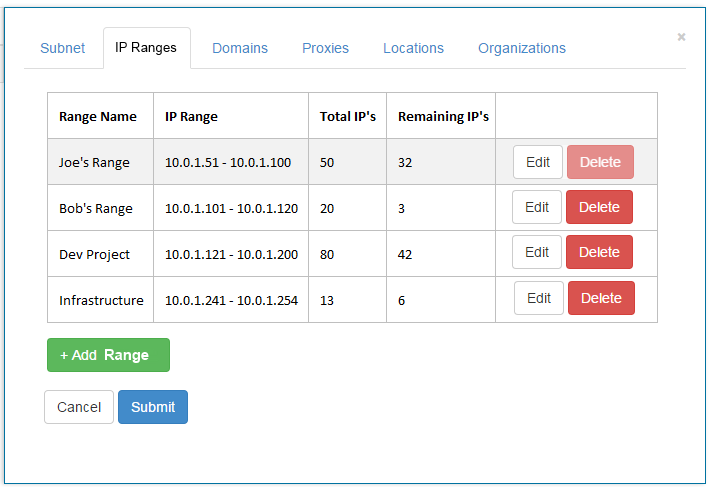 You will be able to create one or more IP Ranges that can be assigned to different organizations, and the "Suggested IP" upon interface assignment will come from the organization's assigned "IP Ranges". Look and Feel: I particularly like the way the Interfaces sub-interface looks like. Sorry I missed the original discussion and thanks for the link. I like the idea but it seems as quite big change, wouldn't it be easier to allow subnets with the same network address so you could use multiple subnets as you originally suggested? I'm not sure why we insist on this value being unique. Allowing multiple subnets with the same network address would certainly serve the need... This feature request is the culmination of all the "needs" and "nice to haves" that people in my org came up with. I guess at this point, we need to know the costs of developing this, and if it even makes sense the way subnets and Foreman work. The simple request of "allow multiple subnets with the same network address" is something we need faster than all the other features in the request. Should I open a separate issue for that less complex request, and leave this one to be possibly picked up at a later date if it makes sense to implement? Hmmm what makes you think that this is a big change, Marek? I like the idea. The only issue I see is Remaining IP column, that information you need to fetch from proxy. I'd suggest not to display it by default, maybe a hoover or link over Total IP could display that. Larry the best think you can do is to try implement that. We will help you with coding and review the POC. Even if your POC is not success, we can maybe take from there and finish if it looks good enough. Lukas I think that orchestration code will be affected and I'm not sure how we'll be able to pick the right range from DHCP server (note that you could specify range out of subnet if I understood the feature correctly). Also validations preventing overlaps can be a bit challenging. So a quick fix that we can do is just disabling the validation. If Larry is willing to work on "full" feature, that's great and I'll try to support as much as possible. alright, i'm willing to give it a go... I have 0 experience in Rails development or producing anything for foreman with this regard. Can you link me to the most appropriate starting place for this integration? Thanks. I think this could help http://theforeman.org/contribute.html, also you can ask questions on our #theforeman-dev IRC channel. Most devs are in Europe timezone but reponses are usually quick. I have opened a competing issue #11250 to provide a simple alternative to this feature request.